It is possible to have Visual change the Active Plane A two-dimensional and flat object. to align with a specified Solid Object. 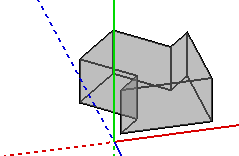 Align to Plane A two-dimensional and flat object. is found in the Status Bar. Select the Solid Object to which the Active Plane The current Cardinal Plane which is the basis for coordinate information and actions. This is the plane of movement of the mouse pointer crosshairs. Working planes are restricted to the three cardinal orientation planes (X-Y, Y-Z, X-Z) in Visual. The working plane sequentially toggles through the three possibilities whenever the Tab key is pressed. The working plane may be moved incrementally in a perpendicular fashion using the up and down arrow keys and the Home key may be used to return the working plane to X-Y at Z=0 (grade level) at any time. is to be aligned by left-clicking with the mouse. Different (not additional) Solid Objects can be chosen if necessary to make the desired selection. Right-click the mouse or press Enter to end the command and Visual will change the Active Plane A two-dimensional and flat object.. Note that the axes are aligned to the surface and have changed to be full screen. Pressing the Home key sets the Active Plane The current Cardinal Plane which is the basis for coordinate information and actions. This is the plane of movement of the mouse pointer crosshairs. Working planes are restricted to the three cardinal orientation planes (X-Y, Y-Z, X-Z) in Visual. The working plane sequentially toggles through the three possibilities whenever the Tab key is pressed. The working plane may be moved incrementally in a perpendicular fashion using the up and down arrow keys and the Home key may be used to return the working plane to X-Y at Z=0 (grade level) at any time. back to the X-Y plane A two-dimensional and flat object..